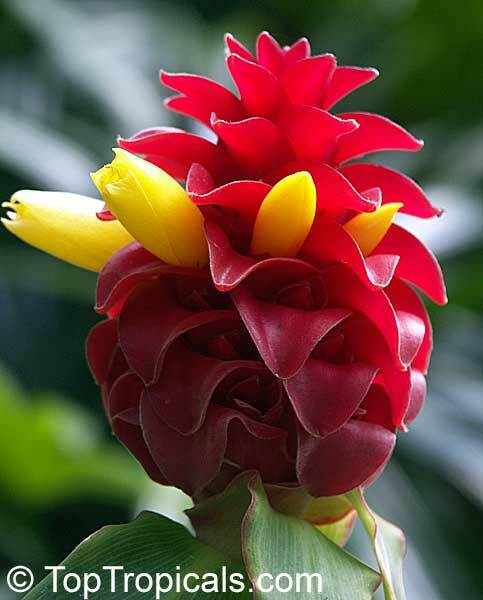 Red Button Ginger. Spectacular red ginger, with bright red button-like flower cones almost year-round. The yellow flowers that emerge from the red cones are edible. The plant can withstand a light frost for short periods of time but will stop blooming. 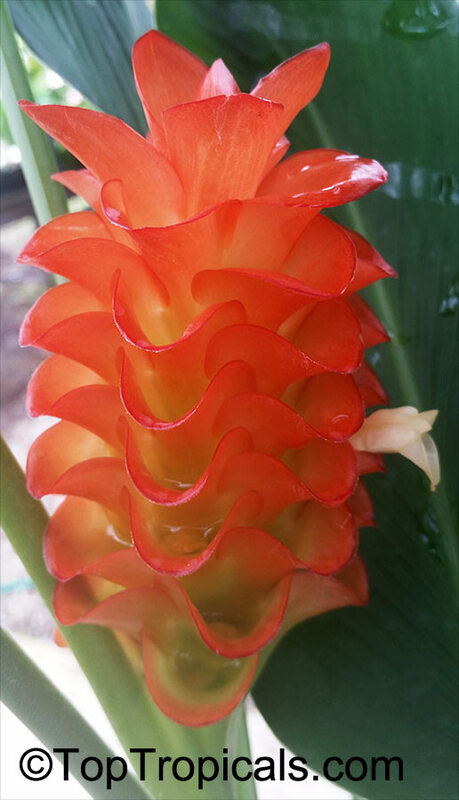 Variegated Spiral Ginger. Originally from South America, this ginger is very popular in Hawaii and Florida. 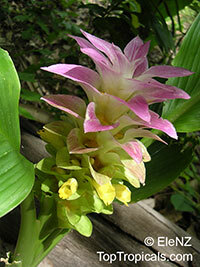 The actual name is C. arabicus variegata and it is labeled Costus amazonicus variegata almost everywhere. 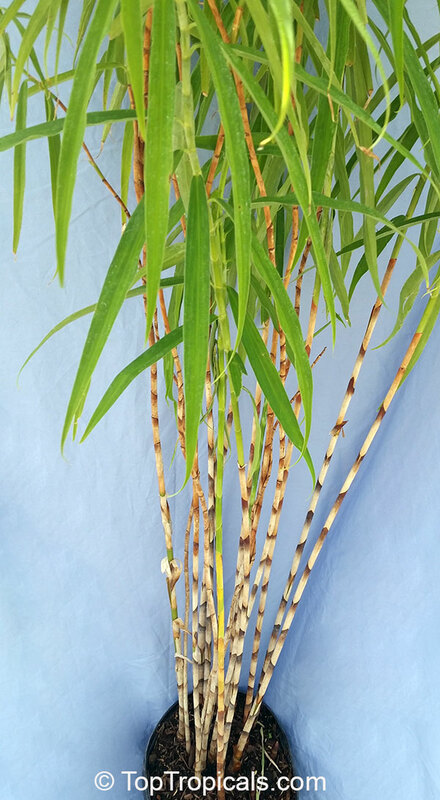 Spiraling stems rise with a strong white variegation and topped with green and white cone like flowers. 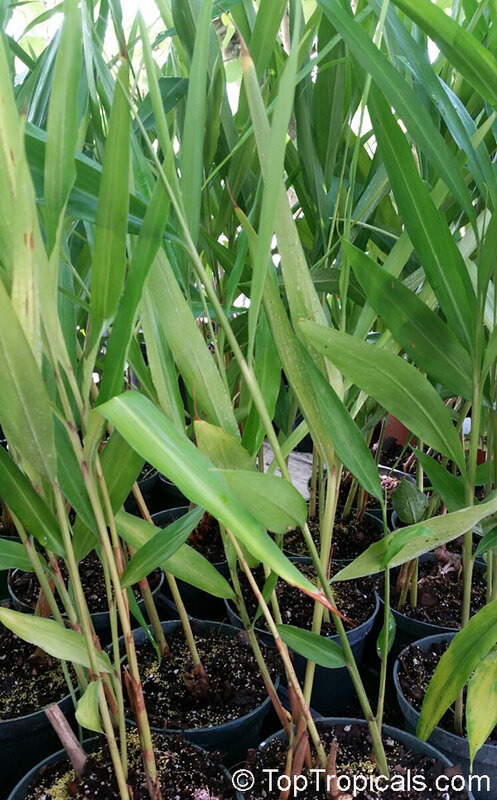 Prefers shade, moist soil and lots of water. 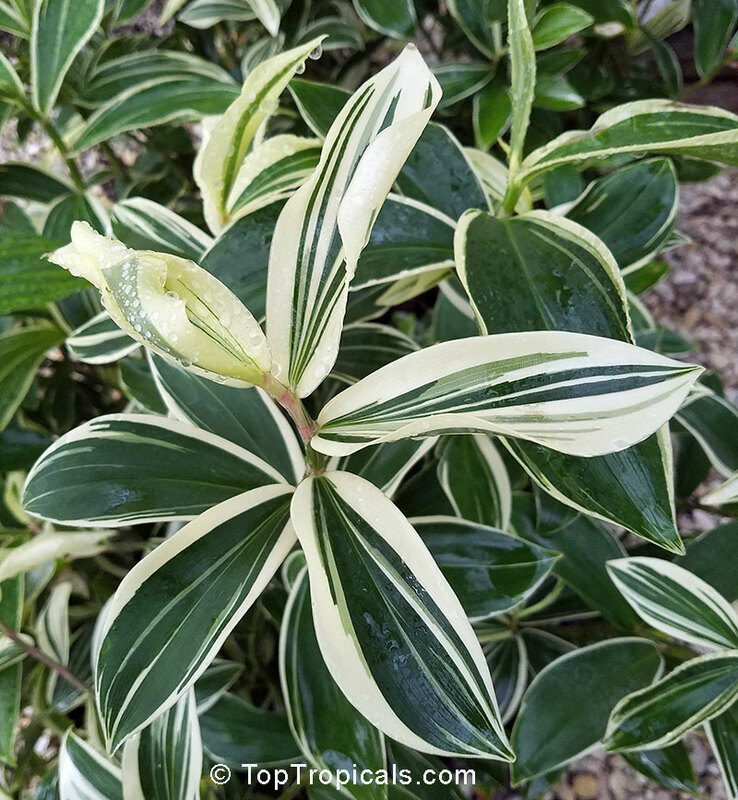 This is a spectacular addition to your shade garden! 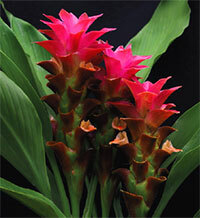 Costus erythrophyllus grows up to 1-2 feet when fully mature. Also known as Ox Blood Costus because of its striking foliage. When the wind shifts and you see the bright red underside that gives it its name. 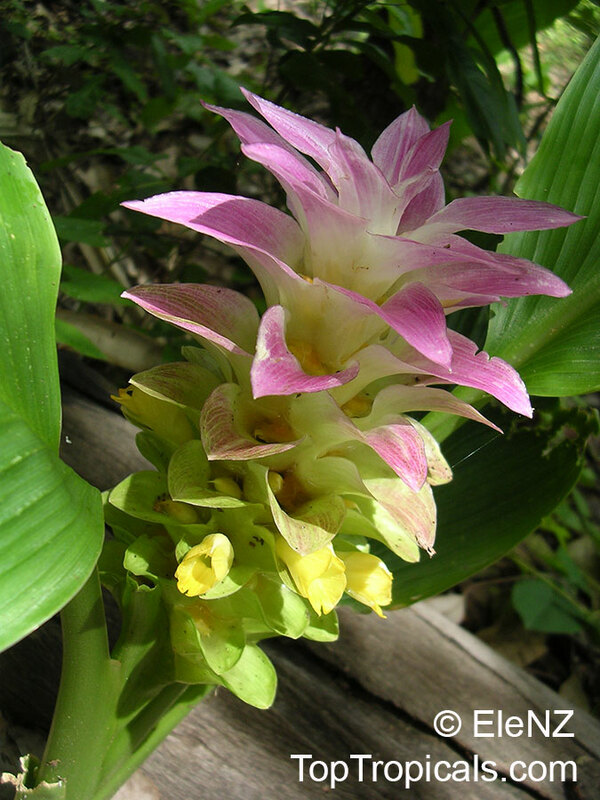 The flowers are relatively large, pale pink and grow prettily cradled in the midst of the leaves. 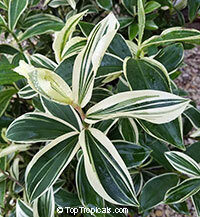 All in all, this unusual looking plant really is a looker which will brighten any border. 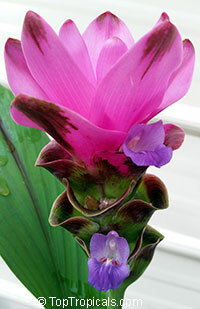 The attractive Costus will be a welcome addition to any garden, hothouse or windowsill. Close related plant, but with yellow flowers - Costus vinosus, that is often confused with Costus erythrophyllus. 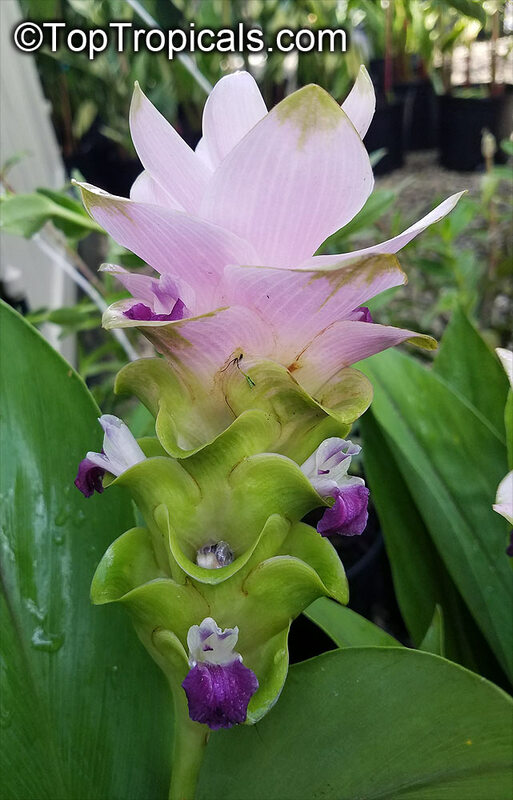 Costus fissiligulatus is an amazing new Costus from Gabon in West Africa. 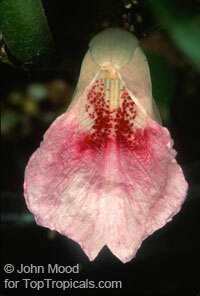 It has a dazzling pink trumpet flower with a yellow throat. 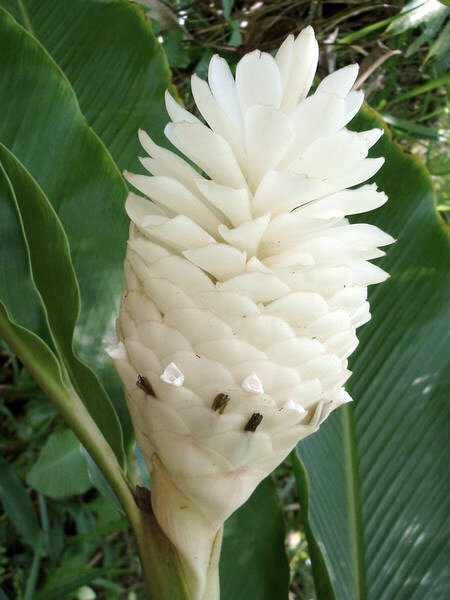 It is very floriferous with an inflorescence of numerous flower buds on a shortish plant of 3-4 ft that stands very erect. 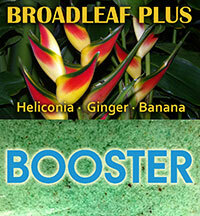 It is an easy grower with similar growing requirements to other gingers. 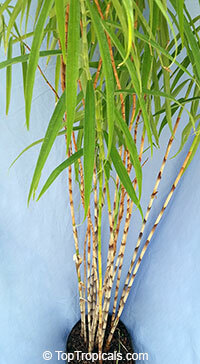 Grown for its unique alternating brown and white banding on the stems, Bamboo Costus looks like real bamboo. It makes a great accent plant when grown in a large pot on the patio or sunroom. 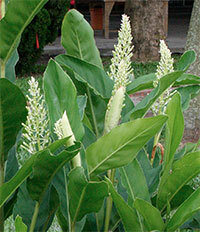 Also called spiral ginger, it has upright stems with a bit of a spiral near the tips. 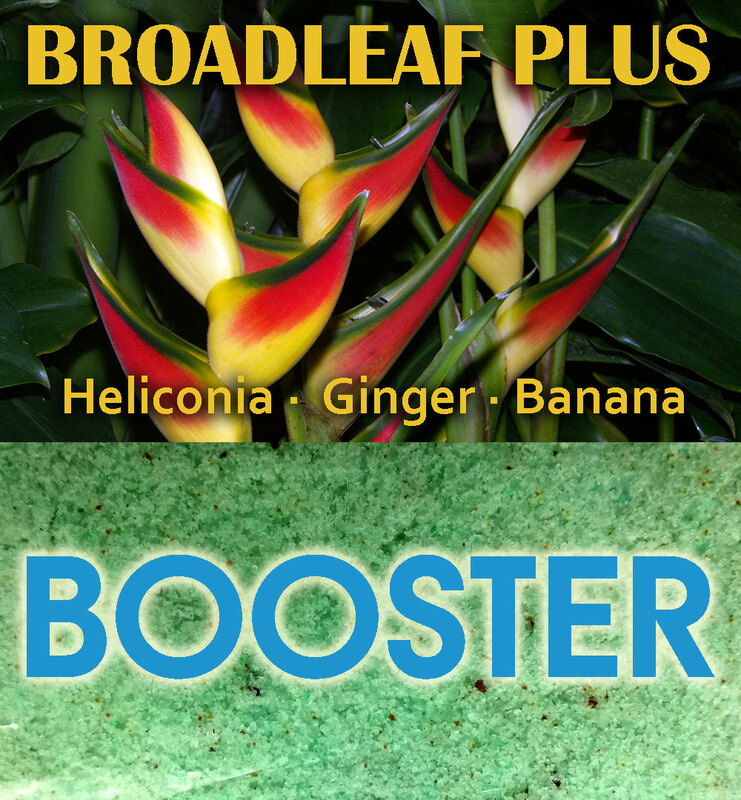 Unusual red and yellow flowers emerge from the base of mature plants. 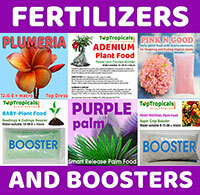 Grow in bright, indirect light in moist, rich soil. 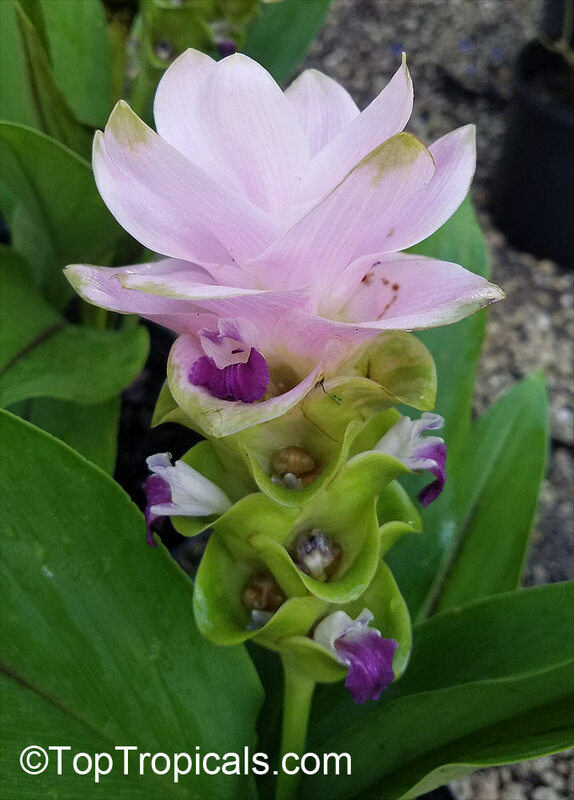 Very showy Siam Tulip with pink bracts and lavender-bluish flowers. 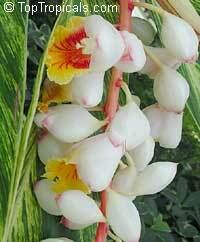 This plant produces an excellent cut flower last up to about 14 days. If placed in a slightly shaded position, flower on the plant can remain for up to 3 months. A new spectacular introduction from Thailand with bright purple bracts, mauve red edge markings, and lavender-bluish flowers. 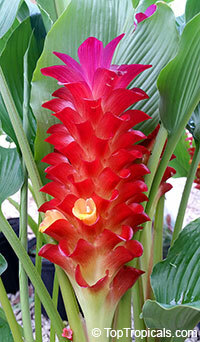 This plant produces an excellent cut flower last up to about 14 days. 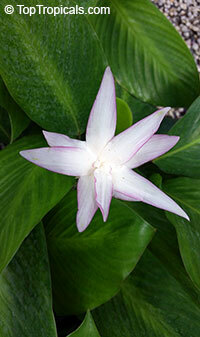 If placed in a slightly shaded position, flower on the plant can remain for up to 3 months. A new hybrid from Thailand with Pink inflorescence and blue flowers. 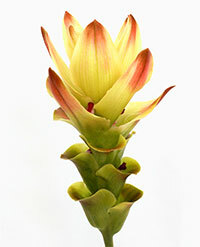 This plant produces an excellent cut flower last up to about 14 days. 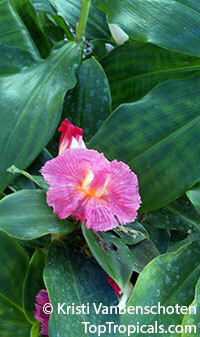 If placed in a slightly shaded position, flower on the plant can remain for up to 3 months. Spice Turmeric, Longevity Spice, Indian Saffron, Tumeric. Turmeric powder might well be the healthiest spice on Earth. Made by grinding the dried root of the Curcuma longa plant, this ancient superfood and key ingredient in curry powder has been used by Indian Ayurvedic healers for centuries. In recent years, also the scientific community has begun to show interest in the potential health benefits of the turmeric root. Turmeric can be consumed in its original powdered form through culinary additions to other foods. 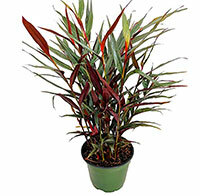 This plant is deciduous through winter-spring. Orange Siam Tulip, rare variety Jewel of Burma. 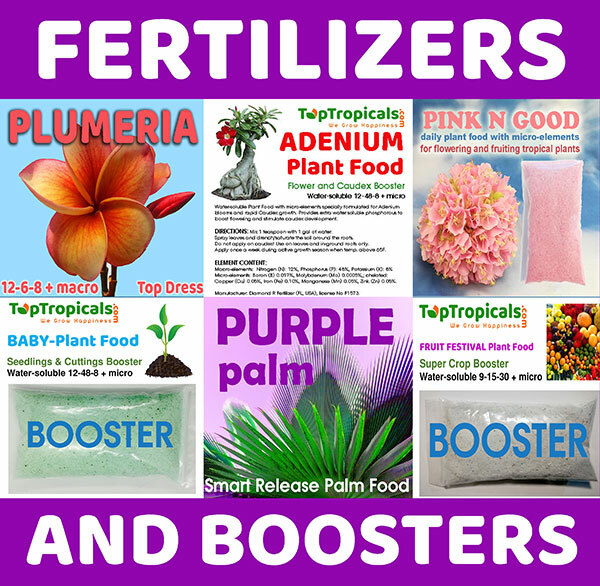 This plant produces an excellent cut flower last up to about 14 days. If placed in a slightly shaded position, flower on the plant can remain for up to 3 months. Red Siam Tulip, rare hybrid. This plant produces an excellent cut flower last up to about 14 days. 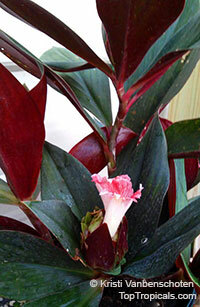 If placed in a slightly shaded position, flower on the plant can remain for up to 3 months. A new hybrid from Thailand with Coral-Pink inflorescence. 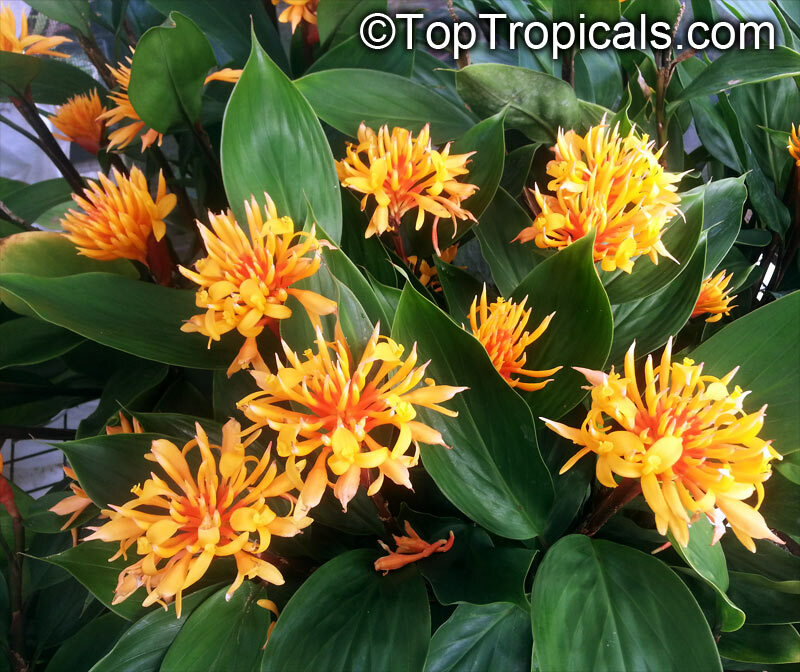 A new hybrid from Thailand with Golden-and-Orange inflorescence.